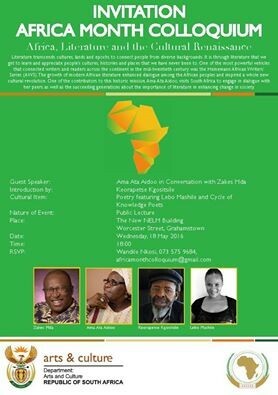 The theme for Africa month 2016 is “Africa, Literature and the Cultural Renaissance”. To this end, Grahamstonians were treated to a literary feast. Leading poet Lebo Matshile, in conjunction with the Department of Arts and Culture, organised a poetry workshop followed by a celebration with Guest of Honour, the Grande Dame of African letters, Ghanian Ama Ata Aidoo. She was supported by national poet laureate, Professor Keoraptse Kgositsile, Zakes Mda, local poets Thembani Zion Onceya and Vangi Gantsho. Ama Ata Aidoo is a truly impressive human being. A courageous woman with a huge heart, an incisive intellect and marvellous turns of phrase, she embodies the invincibility of the indigenous African woman. If I believed in icons, she would be up there on my list. Her life’s work is seminal, as is testified by the numerous prestigious literary awards she has garnered. What she describes as her “politicised imagination” renders her one of the most beautiful, powerful voices to erupt from our precious continent. There was a contagious exuberance between this trio of mature literary giants. They have survived and achieved so much that there is an innate profundity about their presence and sharings. Reading from his memoir, Zakes Mda, cited an instance in the past when he and Ama Ata Aidoo were to give a poetry reading in England. Unbeknownst to them, it was also a charity fund raiser for an education project in Africa. Mda was extremely uncomfortable about this and unsure about what to do. Ama Ata Aidoo seized the moment by informing the organisers that the poets had not arrived with their begging bowls. The charity hostess replied that this was for education, especially of girl children, so necessary since Africa was so poor. Aidoo’s tart rejoinder was that Africa was not poor, but that funds were squandered by corrupt leaders who would never subsidise health and education since they knew they could always rely on foreign aid for these crucial priorities. Mda said he could have kissed her! We were reminded of how far we have come by Kgositsile recalling how he had been given a copy of Richard Wright’s “Black Boy”. This single copy was shared and read all over South Africa. The evening wound up with a splendid poetry performance by Lebo Matshile. This reminded me of how originally, poetry was sung. With the timbre of her voice, its range and inflections, her rendition was akin to one from an orchestra. She is a true diva who takes the spoken voice to another level as she delivers her imagery as fluently as a nightingale. Also special about this cultural triumph was that it was the first function to be held in the new building of the National English Literature Museum. What began as a cupboard of documents in Guy Butler’s study is now a delightfully designed 21st century structure set in in landscaped surroundings featuring indigenous plants. Thus it is a rare instance of public funds being well spent!